If there is enough interest we can have a daytime course starting on Tuesday Oct 31st or Wednesday Nov 1st. Please let us know by email. 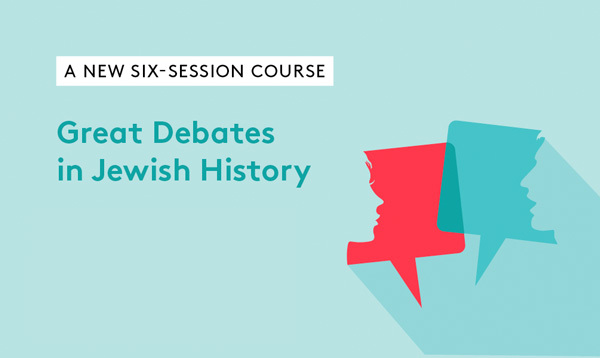 ​Contrasting narratives of the Dead Sea scrolls and the Talmud introduce us to two sides of a fundamental historic debate about rabbinic authority and the interpretation of the Divine word. What led the Dead Sea sect to breakaway from Jewish establishment? What were their theological views? And why were they so opposed to rabbinic interpretation? What role does nationalism play in Judaism? What are the Jewish perspectives on taking up arms when defeat is inevitable? Get into the minds of those who gave their lives at Masada. Discover a nationalistic view of Judaism, one that believes it cannot survive without autonomy in Israel and who chooses death over a survival that is subservient to a foreign nation. In the 12th century, Maimonides’ major philosophical work Guide for the Perplexed was banned and even burned. For an observant Jew, Maimonides took a radical of a rationalistic approach. Beginning during his lifetime and continuing for decades after his death, the Maimonidean conflict and condemnation of his works divided the Jewish world. Why was there such fierce opposition to reason? Is rationalism an acceptable approach to Divine worship? What role does reason play in Judaism? To witnesses of inquisition, auto-da-fé, and expulsion came the proposal of Rabbi Yaacov Beirav to reinstate the Sanhedrin (Jewish high court), to renew rabbinic ordination, and to force messianic redemption. Mere mention of the idea catapulted the Jewish world into a frenzy; some with jubilation, others with uproar and outrage. Can we force the Divine hand to hasten the redemption? Should we? And what of attempts in our own times at renewing the Sanhedrin? Why were Jews of the 1700s opposed to the innocent teachings of the Baal Shem Tov and his preoccupation with prayer, joy, and the simpleton’s relationship with G‑d? What historic tensions set the stage for the style of Judaism practiced at that time that incited the widespread aversion to the Chassidic way of life? In the 1980s, a US Supreme Court ruling permitting public menorah displays deeply divided the Jewish world. What presents a greater challenge to Judaism: The supremacy of a conflicting religion, or the predominance of irreligiosity? Is religion designed to be a personal and private affair, or one to be flaunted in the public domain? Where should Judaism stand on the issues of separation of church and state?